Yes, I rode last nite in that torrential downpour. A conservative guesstimate would be be that over 1" of rain fell on me during that 90 minute ride. To no surprise, I didn't see another living soul the whole ride. Plenty of wildlife though. First up was a respectable-size snapping turtle. Those things are mean as sin. It wasn't digging the fact that I stopped to take it's picture either. When I see these on the dirt or paved trails, I usually help them get across the trail so the next guy behind me doesn't run it over or throw rocks at it. This one was having none of that so I left it alone. Plenty of wild turkey and deer out. Last weekend was my 39th birthday. That puts me in the 40-whatever age group at some races next year. Yippy. Kristine got me a very cool digital video camera that can be mounted on my handlebars, shoots pics and up to 1 hour of vid, USB download to computer or straight to TV. Look for plenty of cool vids on this blog in the coming weeks: "Tuesday Night Crit cam", "Commute Cam", ect. Tying to figure out a cool way to mount it on a dog collar for the "Lou Cam", "Athena Cam", and "Buster Cam". It will be cool to see the world from dogs POV. Kristine also took my to dinner at Garozzo's in Overland Park. Perfect weather for dining outside. Very nice food and wine with Frank Sinatra music playing the whole time. Rode into work today, making this the 5th straight week that i've made the commute 2 out of the 5 days. That well over 1 full tank of gas saved. 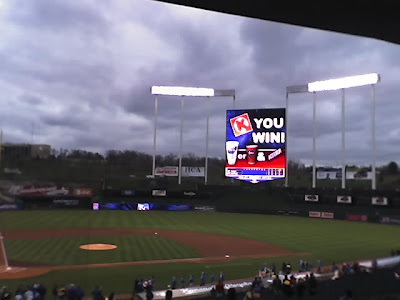 I had tickets to Friday night's KC Royals game against the Minnesota Twins. COLD and WINDY sums up the weather. The Royals started the season great but didn't play good at all on Friday. We left in the 7th with the score 5-0 Twins leading. Had a foul ball rip a wicked curve over the net behind home plate and hit the stairs about a foot from me. No way i'd even attempt the catch that thing. I tried to catch one a few years ago and almost broke my hand, and that was a blooper straight up and down. This ball on Friday would have killed someone. Check out the new scoreboard! That's the largest hi-def plasma screen you'll ever see in your life. Almost TOO big. There's so much information on it, you end up stairing at it instead of watching the game. Last nite was the Tuesday Night Crit #4. 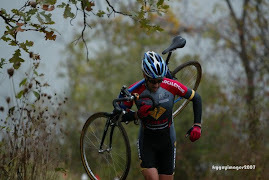 I showed up on my single-ring cross bike and, wearing my old Nantucket Nectar's kit, actually went pretty good. Got into a move with 2 others for a few laps, tried a few moves later that went nowhere, then just sat in. Amazing, no one crashed or came close to crashing last nite, so Kudos to everybody. Shadd, Cameron, and a couple others got a good gap near the end, and with the main group not really working, we got lapped on the last lap. I still stayed near the front and out of trouble and got out of the way for the sprint. I've been giving some serious thought about going with a 29'er hardtail, probably a Niner EMD frame. I'll finish this MTB season out on my Gary Fisher then see how it goes. I take an extended route home using the Mill Creek Streamway Path. Training seems to be going perfectly right now. Once I get up to speed, it takes very little quality riding to maintain it. Once the ground dried out and I could get in some good MTB rides, I was back to my normal technically-proficient self. The commuting to work and back does add a bit of quality riding to the schedule, especially the ride into work. It's moderatly hard and steady the whole way (i'm a stickler about getting to work late). There are plenty of short little kickers to wake you up. I can take my time and just cruise a bit more on the way home ( that's an idea, "just cruise"). Notice the start and end location of the above rides, i'm back in the house on the golf course. This past weekend was the big move with Kristine, the brown dog(Athena), the giant-breed dog(Buster), and several truck loads of stuff. Her dogs are like "hey, when are we going back home?" They'll figure it out. 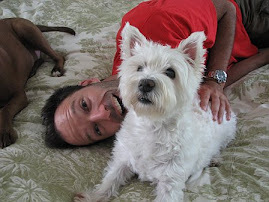 My little white Westie dog, Louis, is back in her Queen of the Castle thone. She was like that at Kristine's house, just more-so now that she's back on home turf. She's not afraid to go for the throat of EITHER of Kristine's dogs. "Big dog in a small package" is under-statement here. Buster could hold her down with one leg, and Athena would make a squeaky toy out of her. 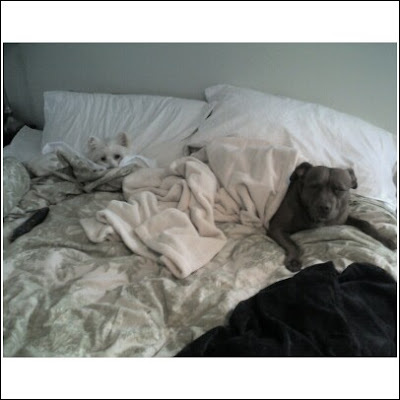 Buster is deathly afraid of Louise and will avoid a confrontation if possible. Lou and Athena tend to get nose-to-nose a bit more, usually going for the same toy at the same time. They've got into it a few times, with both showing battle wounds after. I did track down Lou's papers (she is a pure-bred) and she's over 11 years old, but still pretty spunky!